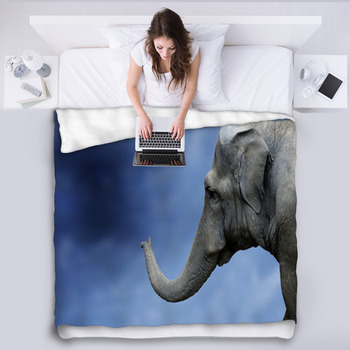 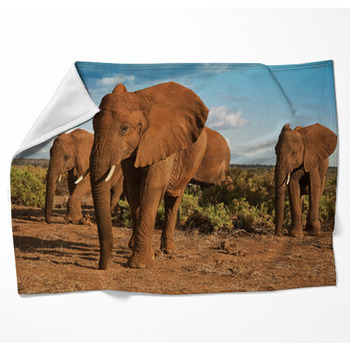 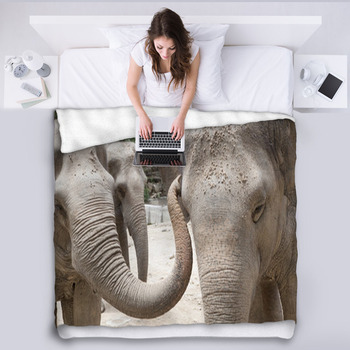 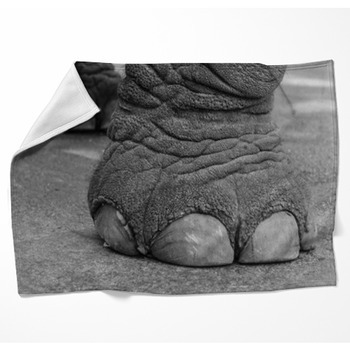 Elephants leave us in awe of their size and strength, inspire us with their gentleness, and now you can enjoy the worlds biggest animals on land with our fleece elephant blankets. 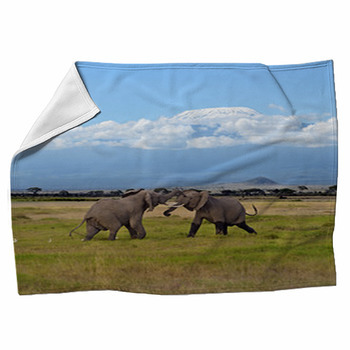 Stay warm at night covered with bed blankets displaying photographic images of a huge African elephant strutting across the plains with mountains in the background, one that is running with its trunk held up high, a herd of elephants kicking up clouds of dust and coming right towards you, or a silhouette of an elephant family, mother, father and baby elephant walking in a line beside one lonely tree and a spectacular orange, red and yellow sky at sunset. 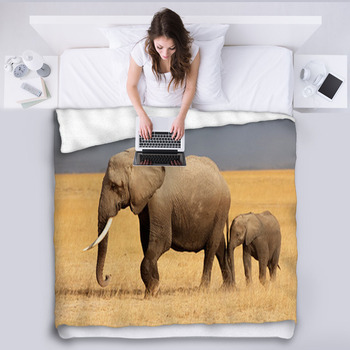 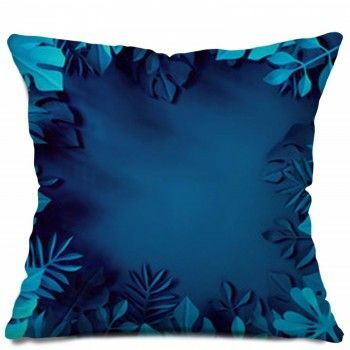 Make your living room into the plains of Africa or the jungles of India with blankets and pillows depicting the profile of its enormous head and tusks as it brings grass to its mouth with its trunk, or a mother elephant walking closely beside her baby down a dirt road. 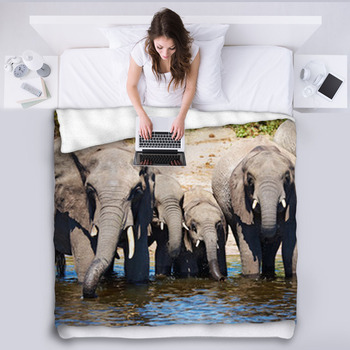 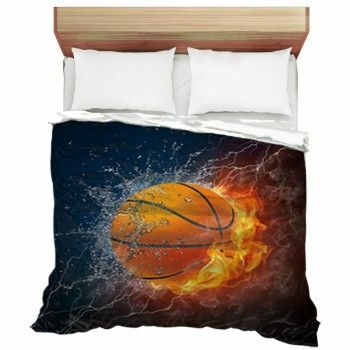 Decorate your kids' rooms with blankets featuring a cartoon purple baby elephant frolicking in a little tub, or one that is balancing on a ball and shooting water out of its trunk, or a girl elephant with big blue eyes, pink ears and a tiara of flowers on her head. 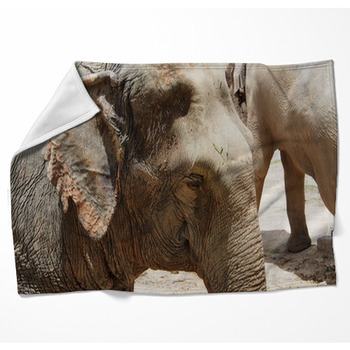 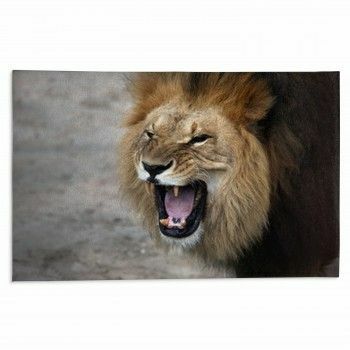 >Bring these immense and lovable creatures into your home end be in awe every day!